The brilliant series of Twin Peaks are usually connected to director David Lynch. Lynch was only one of the creators though, Mark Frost being the other. In all the fuss around ’25 year later’, again all attention seems to go to Lynch. And there we have Mark Frost himself publishing a Twin Peaks book just before the launch of the third series. Frost even did an “AMA” (‘ask me anything’) on Reddit a little while back. So is Frost’s book going to give all the answers about Twin Peaks’ mysteries? The title suggests it does not. “A Novel” it says on the cover. Actually, it is not really a novel either. 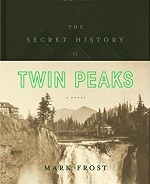 The book is presented as a found dossier about Twin Peaks, its surroundings, its inhabitants and -indeed- its mysteries. Let me start by saying that the book is not about the events of the series! It is not even about the same time in which the events of the series take place. The book starts way earlier and ends somewhat later. The book is hardly about characters from the series, but some of them are included. Sometimes it are rather the parents of characters of the series that have a role in the book, or people who are featured in the series marginally are the most important characters of the book. Like I said, the book is not a story, it is a dossier. An “archivist” got the files from his predecessor and commented on them. Again later an FBI agent gets the files and again commented on them. The files can be anything from notes from personal diaries to top secret files from shady government organisations, field notes of investigations, newspaper clippings and what not. The book starts around the time the first settlers come to live in the area and it is largely about UFOs. Many times the contents seem more fitting for the X-Files with presidents who know things, governments within governments, etc. During the course of the book a different light from what we learned from the series is cast upon a few characters that we know. In this way we do learn a few things that the series left open (such as Major Briggs’ secret work) and the Black Lodge and Owl Cave get quite a different meaning, but it is not like you are going to be let in all open questions that the series series, just a few. I do wonder if these new angles will find their way into the new season. What is a bit too bad is that Frost gave his pompous writing style to almost every person in the book, from Dr. Laurence Jacoby to a 16 year old Andrew Packard. “The Secret History Of Twin Peaks” makes a fun read, especially when you know the names, but it is not much more than a fun read. You are not ‘missing out’ on the series when you do not read it, nor will the series make more sense when you do. The book comes in a quite luxury edition with a ‘double cover’, two colour print and thick paper.